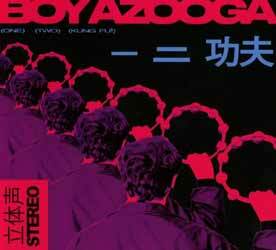 Boy Azooga, the shape-shifting musical mystery tour piloted by Cardiff’s Davey Newington, release their new album, (One) (Two) (Kung Fu! ), via Heavenly Recordings. The band has already put out a number of track from the album as singles. 'Behind Her Cigarette' was released in November last year (2017), and more recently 'Loner Boogie' was unleashed: an infectious swampy-fuzz of an ear worm which made the A list at 6Music. Their latest single, 'Jerry', for me was easily this album's most memorable and interesting song. In fact, because I always have about a dozen albums on the go at any one time (I like to listen to them a lot and then put them aside and listen to them again as I'm writing the review) 'Jerry' was a track that was rattling around in my head for days, and I couldn't place it until I heard it again while writing this review. I think, for me, the band's appeal lies in the fact that from song to song you don't know what you're going to get. Each track is very different to the last. 'Jerry', for example is more an indie single, whilst 'Loner Boogie' is grungy rock and 'Hangover Square' is more a trippy retro pop song.